Since mid-March the magnificent Don Juan II, the iconic Paris Yacht ship, cruising the most beautiful avenue of Paris has a new look! Under the leadership of Pierre Frey this beautiful unit embodied with dark mahogany and copper has been redesigned and now adopts an Art Deco look evoking the golden age of great transatlantic. The geometric and floral directory of the Art Deco movement is stylized here. 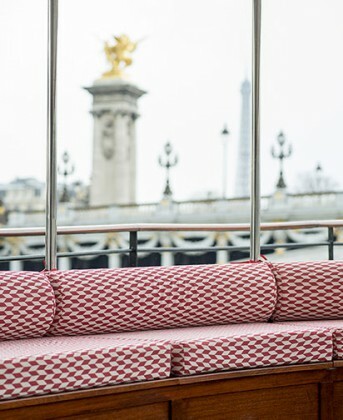 Icing on the cup of champagne, that we can sip on the upper deck watching postcard scenery, the Don Juan II is the only one to offer every evening a gastronomic cruise on the Seine. The new menu devised by Guy Krenzer, the chef that was twice Meilleur Ouvrier de France. He develops and renews along the seasons the menu of these two and a half hours gourmet cruises on the Seine. “Nowhere else in the world there is such a dining room” On the menu, the best of French products: lamb, crab, lobster, asparagus from Landes… So grab your forks! A. F.-M.